Application analytics can throw light into an area we could not look at before: as software developers for desktop software, we monitor how visitors arrive at our website, which pages they visit the most, which are the entry and exit pages. We also measure the number our software was downloaded. And then, after the download, there is silence: We do not know if the user installed the software if he/she keeps using it or he/she abandoned it the next day. We do not know how many active users we have. 1) A low paid vs free installations ration would mean we are giving a lot of functionality for free or the price is high. 2) A high paid vs free installations would mean that we are not giving enough free functionality or the price is very small. Application analytics is the new tool that allows you to look into these matters for the first time. An application analytics dashboard is a quick summary of current data coming from the installed applications. 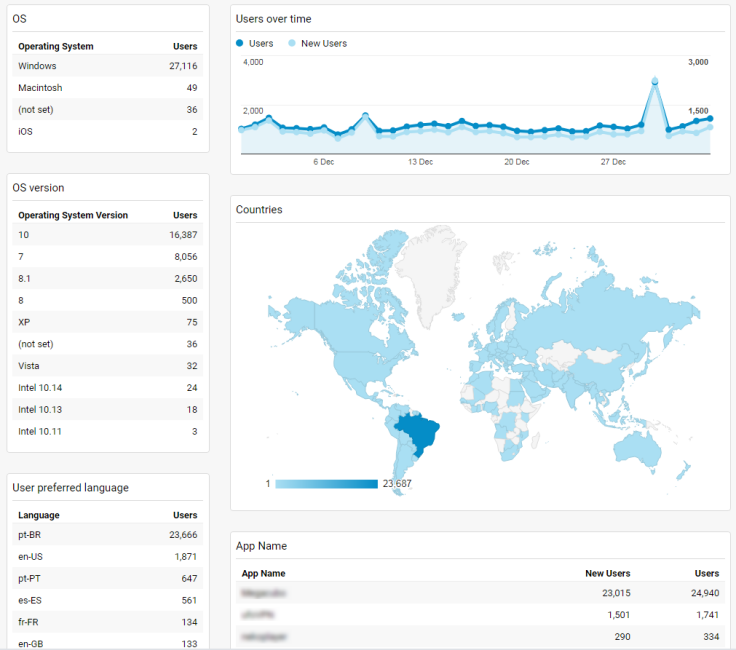 Below you can see a sample of application analytics dashboard. 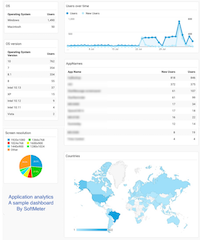 This dashboard was created on Google Analytics (GA) and the usage data of your software are being sent to GA via the SoftMeter library. Note: you can add this dashboard to your GA account, by importing our prebuilt dashboard template. You can easily add application analytics to your desktop (Windows or MacOS) software. You only need to add the SoftMeter DLL or DYLIB to your software package and make one or more calls to the functions of the SoftMeter library. You can add SoftMeter into your software and/or into your installation package (Inno setup script example, Installaware script example). An implementation checklist exists to guide you through all the technical and business steps. SoftMeter has a free and a paid (at a very low price) edition. If you are still not sure if you need application analytics for your software, read "Why developers need software statistics", "Why you need installation analytics", and finally, "become a hero in your software development house".